I haven’t posted here in a long time. Quite a long time—but I’m back to the blog. In the weeks to come, I’ll talk about where I’ve been and why you haven’t seen me, but right now I want to tell you about Lee. 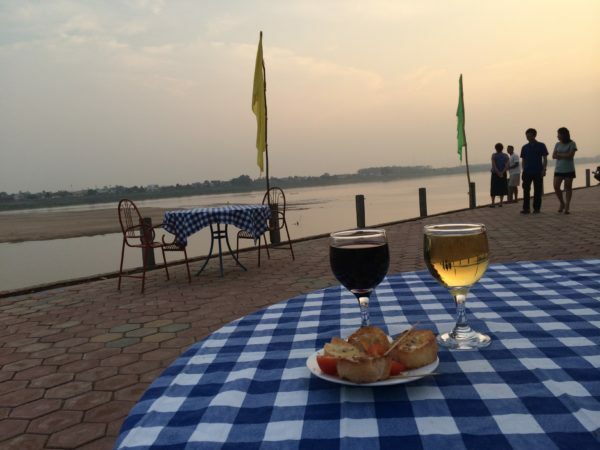 I met Lee on the Mekong River in Vientiane one muggy night a while back, as we drank through the sunset at outdoor tables with pretty little blue-and-white checkered cloths. 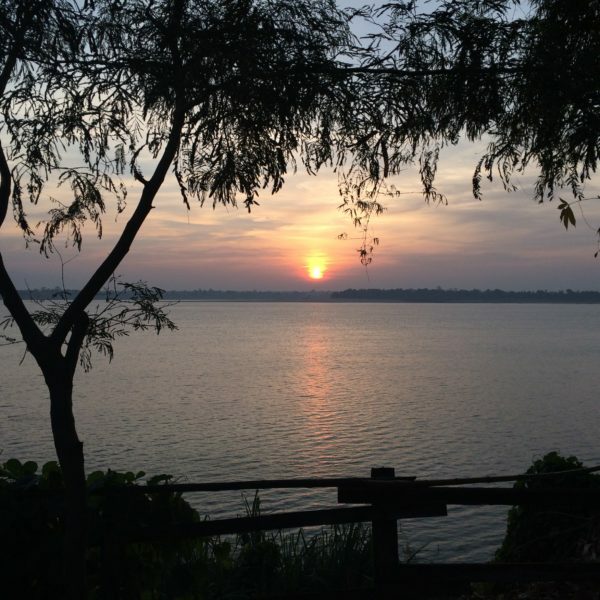 The sun dropped like a firebomb, flashing across the water that divides Thailand, the place where Lee was posted 50 years ago as a young aviator, from Laos, the land he helped bomb to smithereens. Except, back then, Lee didn’t know where his bombs fell or what they hit. He told me he thought he was bombing Vietnam. Guys like Lee never really left the war; they never got all the way home. They’re casualties not counted among the injured or dead. They’re not missing in action—they’re living with it, still, half a century on. I’ve met veterans before who can’t quite reconcile what their country did to them, and what they did to another country on behalf of their own. Some have married and settled along this river, which forms a sort of demarcation line between their coming-of-age as warriors, and the older age when the consequences of past actions roost in the mind. Others, like Lee—a North Dakota cattle rancher—split their time between the two countries that have shaped them into the people they are today. I didn’t formally interview Lee. I don’t have his full name, or address, or phone number. I have only the happy-hour stories he brought when he sat at our table. He knew I was a journalist, and he said that’s why he wanted to talk. He said it’s hard to find Americans who understand his story. His narrative adds to an archive of evidence on the US war in Laos, which began with attacks on anti-aircraft positions in the north on June 9, 1964. It escalated with the start of Operation Barrel Roll on Dec. 14 of the same year. Over the following nine years, it became history’s largest bombing campaign, executed mostly in secret. Between 1964 and 1973, US forces and their allies flew more than 580,000 raids over Laos, the equivalent of one bombing run every eight minutes for nine years. It was guys like Lee who ended up dropping, all told, more than 4 billion pounds of bombs—more than all bombs dropped during World War II. That made Laos, per capita, the most heavily bombed country on earth. No one knows how many people died during those raids, but 20,000 Laotians have been killed and injured by US bombs in the decades since. That’s because an estimated 30 percent of all ordnance dropped didn’t detonate when it fell. Even after decades of clearance, millions of bombs remain in the soil today, a hazard to all. Sometimes farmers hit bombs with their hoes. Sometimes a mother lights a cooking fire and it explodes. In the far north, I interviewed a woman named Mai who told me her family was plotting a new garden when her teen-aged daughter hit something in the ground that went “clink.” She dug to see what it was, and a length of steel appeared—more and more of it, the farther she dug. That’s when Mai started to worry, thinking, “It’s not just metal, it’s a bomb—and it’s unexploded.” When a clearance team detonated that 750-pound bomb the following year, I ducked for cover a mile away, listening to the pat-pat-pat-pat-pat of shrapnel, as dust and debris fell around me. Lee told me he never knew he was killing civilians in Laos when he dropped his bombs. He never knew little Lao kids would continue to die decades later. Lee had been stationed at Ubon Royal Thai Air Force Base, a key launch pad for US planes during the war. He said his job was to follow instructions: aim the plane at the coordinates he’d been given, drop the bombs, then loop back to base in Thailand. In an era before Google Earth and GPS, Lee assumed his targets were all in Vietnam. But today we know better: search the National Archives, and you’ll find records for hundreds of thousands of bombing raids with dates, times, weather conditions, airplane models, target coordinates, and types of bombs dropped—in Laos. That was the “Secret War,” unknown to the American public at the time, and not fully understood by those fighting it. But there were days when Lee did realize he was hitting Laos. If, for some reason, he couldn’t drop his payload on his official target, he said he dumped his load somewhere—anywhere—over Laos before landing in Thailand. He said that’s what everyone did. He remembered the way the guys on base all thought: We’re bombers. We drop loads and come home empty. That’s our mission. Nobody fails. Lee remembered leaving Ubon in planes packed with bombs weighing 500 pounds, 2,000 pounds—it depended on the mission. They flew high enough that people on the ground never knew the bombs were coming. But Lee saw the explosions from more than 30,000 feet when planes beside him dropped their loads. He still had vivid recollections: giant mushrooms of fire rising from the rolling forests. He called the blasts “impressive,” but not in a positive way. Lee learned where he “was at” when he returned to Southeast Asia several years ago and recognized his own history in the stories that Laotians told about the war. He nodded toward the wife of the bar owner who had brought us olives and pickles to nibble as we talked. Lee said she was a child when the bombs started falling on her home in southern Laos. Vientiane, this French colonial capital on the Mekong, was safe. It was refuge. “She had to come here,” Lee said. But the rest of the country was pummeled like no other in human history. We’ve seen the scars: plains of craters that stretch for miles in a landscape so altered that geographers are studying such bombscapes as a mark of the anthropocene. When war strikes that hard, half a century isn’t enough time to recover—not for the land, not for Lee. Not for many of the people who live here. Lee told me he returns to Laos regularly, to think. That’s what brought him to the Mekong the night we met. I asked him what he had in mind for the future, and he said he really didn’t know. He had a wife back home. He had a ranch full of cattle. But he also had these long, hard memories in Laos. Lee’s head was stuck between two worlds—one that knew almost nothing about the long-ago secret war; the other with lives still shaped and defined by the bombs he dropped when he was a kid flying high in the sky. Lee couldn’t see his targets 50 years ago. But he saw them in the aftermath. This, all of this, is why Jerry and I have decided to turn our book into a documentary film. It’s taken a few years to gather footage, and we’re now in the final stages of production. We launched the website and trailer last week. Thank you, Andy! Life has taken a few different turns, but I will be writing here again on food, global issues… and soon, also, the business of journalism & the craft of writing. Thanks for reading!